The CT505-100 supports SIP VOIP calls, including RTP data-stream generation. It can make 100 calls to itself (200 VoIP soft phones) per chassis. The CT505-100 is excellent for testing whether or not an existing infrastructure can handle increased VoIP call load, and can also be used to test SIP gateways and other infrastructure. The CT505-100 uses the MAC-VLAN feature to allow one virtual interface per phone, so each phone can use a unique IP address and use standard SIP protocol ports. 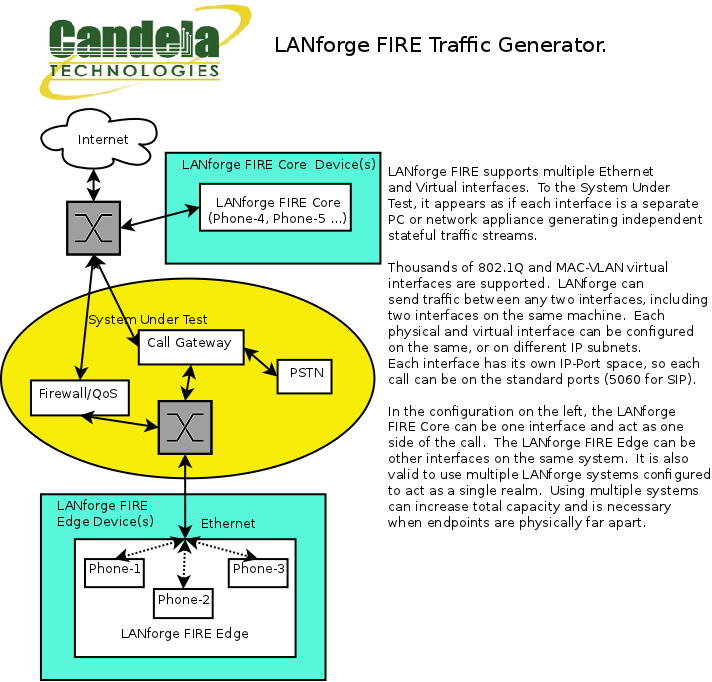 Normal LANforge-FIRE traffic generation features (Ethernet, UDP, TCP, HTTP, etc) is also supported by the CT505-100 at no additional charge. The PESQ automated quality scoring module is included. The CT505-100 1U rackmount chassis fits into a standard rack and is only 14 inches deep. It supports standard VGA, Keyboard, and Mouse interfaces for easy console/desktop access to the system. The rackmount chassis is relatively noisy, so it is better for a data center deployment than a desktop environment. Other form factors better suited for traveling or desktop use are also available at similar prices and performance. More powerful systems are also available and multiple LANforge systems can be clustered together into a single managed realm for increased call capacity. No additional hardware or software is required, but you may wish to manage the system using the LANforge-GUI on a separate machine. Connect Management ethernet port to Management network or management PC. If connecting directly to a PC, an ethernet cross-over cable should be used. Or, connect VGA, Keyboard, and Mouse to the chassis and manage it locally. Connect one traffic generating port to the downstream side of the device under test. This usually is considered the 'client' side of the network and will host most of the virtual interfaces. Connect second traffic generating port to the upstream side of the device under test. Virtual interfaces may also be added here in order to emulate multiple servers. Connect power plug to a standard US or European AC power source. If managing remotely, install the LANforge-GUI on a separate management PC or Laptop. Windows and Linux GUIs are supported: Select the correct one from the CDROM or Candela Technologies Download page and install it. The CT505-100 should now boot. If DHCP is enabled on the Management network, the CT505-100 will automatically acquire an IP address. If DHCP is not available, the IP address will be set to 192.168.1.101 by the LANforge scripts. Start the LANforge-GUI on the management PC, or the CT505-100 server if managing locally, and click the 'Discover' button. It should find the CT505-100 appliance and add the IP address to the drop-down box in the Connect widget. Press 'Connect' and you will be connected to the CT505-100. Select the Layer 3, VOIP/RTP, Layer 4 and other LANforge-FIRE related tabs in the GUI to see existing traffic connections and to modify them or add new ones. You can also view a real-time report of the test with the 'Display' button for some traffic types. Any modifications take place immediately after you click 'Submit'. LANforge VoIP/RTP Call Generator Feature Highlights. SIP protocol used for call management. SIP over UDP is supported on both Windows and Linux. Can use directed mode, where VoIP phones call directly to themselves. Can also use Gateway mode where the VoIP phones register with a SIP gateway. RTP protocol used for streaming media transport, and supports the following CODECS. More codecs may be supported in the future. G.711u: 64 kbps data stream, 50 packets per second. Speex: 16 kbps data stream, 50 packets per second, www.speex.org (Linux ONLY). G.726-16: 16 kbps data stream, 50 packets per second. G.726-24: 24 kbps data stream, 50 packets per second. G.726-32: 32 kbps data stream, 50 packets per second. G.726-40: 40 kbps data stream, 50 packets per second. G.729a: 8 kbps data stream, 50 packets per second. NONE: A messaging-only configuration is supported. Supports PESQ automated voice quality testing. RTCP protocol used for streaming media statistics (SIP only). Each LANforge VoIP/RTP endpoint can play from a wav file and record to a separate wav file. Almost any sound file can be converted to the correct wav file format with tools bundled with LANforge. Sample voice files are included. Current benchmarks show support for 280 or more emulated VoIP phones per high-end machine. LANforge VoIP/RTP endpoints can call other LANforge endpoints or third party SIP phones like Cisco and Grandstream. Third party phones can also call LANforge endpoints and hear the WAV file being played. Layer 4: VOIP Call Generator (SIP, RTP, RTCP). The CT505-100 is able to support 100 calls and 1Gbps or more of regular network traffic, depending on protocol mix and speed of the network under test. The portable chassis configurations may run at different speeds than the 1U rackmount systems. Hardware supports over 10,000 TCP connections on a single machine, but base license package includes 1000 licenses. Contact sales for additional licenses. High-End Intel Multi-Core 1U rackmount server. Operating System: Fedora 64-bit Linux with customized Linux kernel. 2-port 10G fiber or copper CX4 option available. Up to 6 PCIe Intel Pro/1000 10/100/1000 Ethernet ports. Additional 10/100/1000 Ethernet interface for management. 6 GB or more RAM. 80 GB or larger Hard Drive. Solid State Drive option available. Standard US or European power supply (automatically detects EU v/s US power). Weight: 18 lbs or 8.2 kg. Dimensions: 17 x 14 x 1.75 inches (14-inch deep 1U rackmount server) Metric: 432 x 356 x 44 mm. Estimated Power Usage: 1.4 Amps @ 120 VAC under load, 0.7 Amps idle.